Yesterday, Norway’s Opera Software announced the release of the Opera Mobile Store (image top right), a cross platform app store for Android, BlackBerry, Java, Symbian and legacy Palm OS and Windows Mobile devices. The store is a mobile web app at mobilestore.opera.com. It was created in partnership with Appia (formerly PocketGear) and includes both free and paid apps. When I tried it the only payment option available was by credit card. Publishers receive 70% of net sales revenue (after taxes and billing costs). Developers and publishers can sign up on the Opera Publisher Portal. 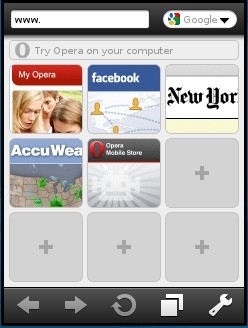 Opera is promoting the Mobile Store in Opera Mobile and Opera Mini, where it’s linked to from the browser’s Speed Dial launch screen (image top left). The Opera Mobile Store link can be deleted by users who don’t want it taking up one of the nine Speed Dial slots. The new appstore is launching with an impressive catalog of over 140,000 apps. Given the Opera mobile browser’s 100 million users, the Mobile Store is pretty much guaranteed loads of traffic right from the start. In pre-release Beta it has averaged 70, 000 downloads per day. Opera’s Store is not limited to Opera users either and works in virtually any mobile or desktop browser. It’s available in over 200 countries. I tried the Opera Mobile Store in Opera Mini on a Motorola i1 (Android), Nokia N8 (Symbian^3) and a Motorola Rambler WX400 (a low-end Java feature phone). The webapp correctly identified the i1 and N8. With the WX400, I had to pick a phone manufacturer and model. The WX400 was listed but took a lot of scrolling to find in a long alphabetical list of models. App discovery in the Mobile Store leaves a lot to be desired. The site search often returns completely irrelevant results. For example, a search for “file manager” brought up several personal financial apps, a web browser, two password managers and a music player, but no file managers. Searches for specific apps by name worked better. You can also browse the catalog, which is divided into categories like Tools, Internet and Calculators and also has Top Paid, Top Free and Featured groupings. The categories are quite broad, all games are lumped into a single category. 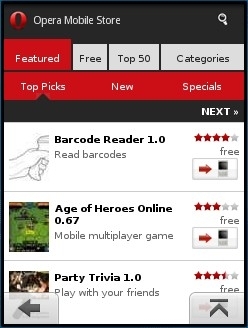 A number of apps are miscategorized with aberrations like the Calculators category which lists several games but no actual calculators on the first page of results. Not everyone is happy with Opera’s entry into the mobile app download business. GetJar, the leading independent mobile app store reacted to the new competition by pulling Opera’s browsers from it’s catalog, Opera and GetJar both say they are still negotiating and hopefully the Opera products will return to GetJar, where Opera Mini has been one of the top downloads for many years. As always, the best way to download Opera Mini or Mobile is directly from Opera at m.opera.com where you always get the latest version best suited to your device. This entry was posted in Downloads and tagged App Store, GetJar, Opera Software by Dennis Bournique. Bookmark the permalink. Well, all Android apps are Java.